FORT LEWIS, Wash. (1st SFG release) – Staff Sgt. David W. Textor had two main goals in life: be a great Soldier and be a great father. 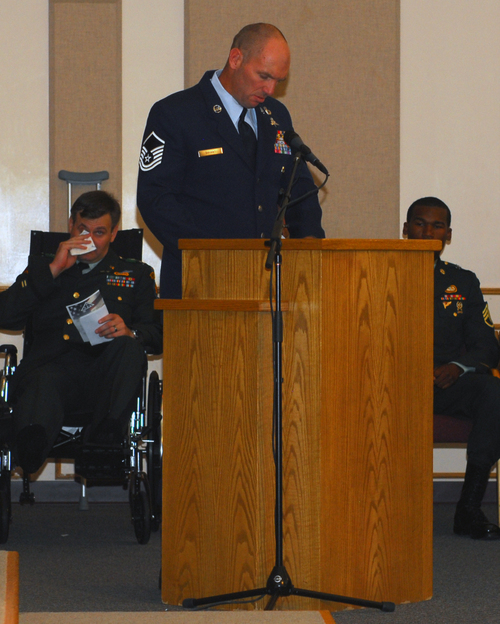 Textor, who earned his Green Beret in 2006, was a weapons sergeant assigned to Company A, 3rd Battalion, 1st Special Forces Group (Airborne), who was memorialized July 28th at the Four Chaplains Memorial Chapel on Fort Lewis, Wash. The native of Jamestown, N.Y. died July 15 from injuries sustained in a vehicle accident in support of combat operations in Mosul, Iraq. Textor, an avid outdoors man who enjoyed camping, riding his bike, taking walks and spending time with his family was described as a patriot who deeply believed in his mission. "He wanted to fight for his country and his children," said Colette Textor, his wife, in an interview in The Olympian newspaper. Textor was laid to rest July 24 in Fairbanks, Alaska in a separate ceremony. Textor's military education includes the Warrior Leaders Course, Basic Noncommissioned Officer Course, Survival Evasion Resistance Escape Course, Basic Airborne Course, Ranger School and Special Forces Qualification Course. His awards and decorations include National Defense Service Medal, the Iraq Campaign Medal with campaign star, Global War on Terrorism Service Medal, NCO Professional Development Ribbon with Numeral "2" device, Army Service Ribbon, Overseas Service Ribbon, Expert Infantryman Badge, Parachutist Badge, Ranger Tab and the Special Forces Tab. He was posthumously awarded the Bronze Star, the Purple Heart, the Meritorious Service Medal and the Combat Infantryman Badge. Textor is survived by his wife, Colette, and their five children Caleb, McKenna, Ryan, Boden and Jadon of Olympia, Wash; his father Bill Textor, of Pine City, Minn.; his mother and stepfather, Jennie and Kevin Lindberg of Salem, Virginia; and his five sisters: Laurie, Michelle, Terra, Karen and Kellie. Follow this link to pictures of Fort Lewis's 1sy Special Forces Group Organizational Day. Stars & Stripes has a nice story on Fort Lewis Green Berets in Korea. FORT LEWIS, Wash. (USASOC News Service) - On a day forecasters had called for rain, it was all sunshine for shooters of the 1st Special Forces Group (Airborne) at a shooting competition here Dec. 6. Fifty shooters from the 1st Special Forces Group (Airborne) and the Canadian Special Forces gathered at Range 43 for a battle of accuracy and speed as part of the 63rd Annual Menton Week, a celebration commemorating the inactivation of the 1st Special Service Force. At the end of the day, it was the Americans who came out on top. Shooters were given 110 seconds to hit 30 targets while shooting from standing, kneeling and prone firing positions and while transitioning to different scenarios. In addition, competitors had to switch to an M-9 pistol after firing an M-4 carbine. Glen Davidson of 1st SFG (A) finished as overall first place, scoring 99 of a possible 100 points. The Americans took four out the top five places in the competition. Top Canadian finisher Tim Hoekstra ended up third overall with a score of 95. Hoekstra was among a handful of shooters eligible to re-shoot after a weapon malfunction, likely caused from a faulty magazine. A judge of the competition stated how well Hoekstra was shooting before having his flow interrupted. Arguably, the person most satisfied with results of the competition was Col. Eric P. Wendt, commander of 1st SFG (A). FORT BRAGG, N.C. (USASOC News Service, Nov. 1, 2007) — An Army Special Operations Soldier died Oct. 30 when he succumbed to injuries sustained in a off-duty motorcycle accident in Tacoma, Wash.
Staff Sgt. Thomas S. Storrs, 26, was a military intelligence specialist assigned to the Military Intelligence Detachment, Group Support Battalion, 1st Special Forces Group (Airborne) at Fort Lewis, Wash. He enlisted in the Army in 2000 and had been assigned to the 1st SFG (A) since 2001. Storrs is survived by his father, Norman, of Petersburg, Va., his daughter and mother. AP reports that Fort Lewis Special Forces Soldier Staff Sergeant Joseph F. Curreri died in an accident last Friday in the Philippines.AP reports that Fort Lewis Special Forces Soldier Staff Sergeant Joseph F. Curreri died in an accident last Friday in the Philippines. Bringing Language and Cultural Skills to the Battlefield. Imagine a Soldier, cleaning his weapon in a team room, while in the background you can hear the news being reported in Korean on the TV. 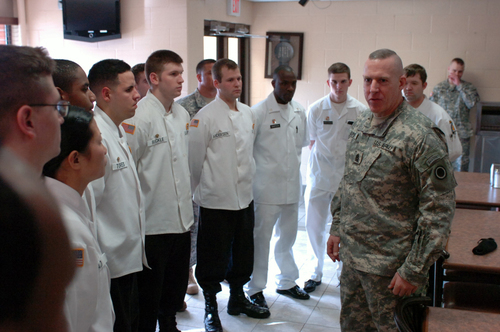 Picture another Soldier having a conversation in Thai or Tagalog, discussing a program of instruction for upcoming training. The First Special Forces Group (Airborne) emphasizes language and cultural training because they say these are critical skills used in rapport building and daily communication overseas. The Green Berets of the 1st SFG (A) take the language and cultural skills they learn in the classroom as well as in their spare time, and utilize these skills in a field environment to make the mission a success. Building relationships with the local people of the country is vital to the success of many Special Forces operations, and one of the best ways to build these relationships is to speak the language and understand the culture of your host-state forces. As an example, the 1st SFG (A) used the annual exercise, FOAL EAGLE, as an opportunity to further train, educate and evaluate their Green Berets’ practical language and cultural skills. Training exercises like FOAL EAGLE test what the written and listening tests cannot: effective inter-cultural communication in a field environment. “The commanders and language program administrators receive the true-measure of their Soldiers’ abilities through these exercises. And the Soldiers’ confidence is bolstered through their abilities to communicate and improve on their speaking skills,” said Sergeant First Class Amis. It’s important to remember, often when Soldiers enter a village or neighborhood, their appearance can be frightening to some villagers, so it is important that Soldiers can immediately and effectively express their intent, and break down communication and cultural barriers with the host-state population. The evaluation exercise used in exercise FOAL EAGLE was set up to mimic villages in Asia, using ethnic Korean-Americans and both Korean and Chinese speakers. In this scenario, the Green Berets were tested in their ability to go into an area, build rapport and establish local control, and to gather information from the local population that can be used against enemy forces. No English was allowed in the scenario, either from the Green Berets or the role players. How the Green Berets create the rapport that facilitates local control and information gathering has everything to do with cultural training and communication. The A-Teams in Special Forces have a mixture of Soldiers talented in various languages. On one team, a fluent Chinese speaker--SFC Matt Carey-- used his language skills to build rapport by teaching the role playing villager –who couldn’t speak Korean, but could only speak Chinese, how to perform a medical procedure. All of the medical instruction given by SFC Carey was presented in Chinese Mandarin. The ability to communicate, form relationships and impart knowledge was affectively used, and was in turn, reciprocated with intelligence about enemy whereabouts, manpower and weapons. During the exercise, the Green Berets conducted a mixture of missions, ranging from direct action raids to medical civic action projects (MEDCAPs). During the MEDCAP scenarios, role-playing children and adults received treatment from the A-teams for long-suffering ailments and routine vaccinations. As the Green Berets performed these actions, they spoke and joked in Korean, and built friendships with the role-players. The MEDCAPs allowed the Green Berets to demonstrate their caring for the local population, and several of the role players thanked the Soldiers for their efforts by disclosing information about the local enemy forces. To conduct this training, several fluent linguists, both civilian and Soldiers alike, were either contracted or volunteered to role-play as villagers for the exercise. Unknown to the Green Beret A-teams when they parachuted into the exercise was just how much foreign language would be utilized in this event. Since the villagers spoke only in Korean or Chinese, the Green Berets relied heavily on the Soldiers on their A-Teams with Korean and Chinese language skills. Different exercises in the First Special Forces Group emphasize Tagalog for the Philippines, Indonesian, Thai and other Asian languages. This particular integrated field immersion language training lasted for several days, and the A-Teams were forced to adapt and overcome in this environment. As they conducted the AAR following the exercise, the Green Berets noted their increased language and cultural capabilities, and increased abilities to communicate, build rapport and impart technical military knowledge in a realistic situation. The Green Berets re-affirmed their strengths, improved their weaknesses, and learned what actions or Korean and Chinese vocabulary may be offensive or misunderstood in their target-country language. While voice response translators are sometimes used today on the battlefield, they are no where near the effectiveness of a Solider on the ground, speaking the language of the local population, understanding the local culture and building rapport. “Rapport is one of the most important tools we have,” said Colonel Eric P. Wendt, commander of First Special Forces Group (Airborne). “You cannot hit what you cannot see. The local population knows who the local enemy are. The trick is getting the local populace to tell you who the bad guys are on the block, in the village, and in the neighborhood. One of several key tools we use to gather this actionable intelligence involves building rapport with the locals, and speaking the local language, as well as understanding the local culture are quite helpful as we establish this rapport. Once we know who the enemy are, we can transition to direct action and either kill or capture the correct enemy, without inflicting needless collateral damage. At the end of the day, time spent training and preparing to speak the local language and understand the local culture is time well spent. 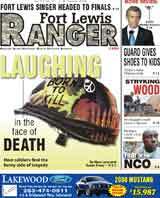 Two soldiers from Fort Lewis's 1st Special Forces Group died this week. Click here for the report.